The second series of the Miss Fisher Murder Mysteries begins next week on 1 October at 10pm on Alibi. The first of the thirteen episodes is titled Murder Most Scandalous. 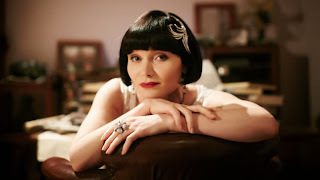 Kerry Greenwood's heroine Phryne Fisher has appeared in twenty books so far with the first book in the series having been published under three titles: Cocaine Blues, Murder by Misadventure and most recently Miss Phyrne Fisher Investigates. Miss Phryne Fisher is back to solve crimes and secure justice with her unique style and sophistication. The second series of Miss Fisher’s Murder Mysteries follows the independent and unflappable leading lady detective Phryne Fisher in an opulent take on the traditional crime drama exploring the fascinating ‘between-the-wars’ era of 1920s Melbourne. From the shadowy lanes of the city to the halls of academia, from high-class brothels to haute couture, Miss Fisher defends the innocent and juggles admirers with her usual panache, all the while keeping up her delicious dance around Detective Inspector Jack Robinson. Brilliant - only a few weeks behind Oz. This is a good crime fiction series but is also just fun to watch for the quality of the acting and the writing, especially the way the characters spark off each other.